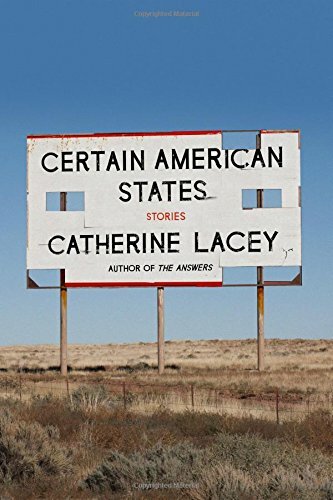 "Catherine Lacey is one of our greatest living sentence-level writers, and I look forward to her short stories the same way I look forward to a collection by Ben Marcus or George Saunders. Her syntax is the magnificent stuff of uncertainty and grief, her characters brilliantly slipshod. Certain American States is full of characters adrift, so sick of platitudes, here to sum our modern exhaustion. Fans of Lacey’s novels Nobody is Ever Missing and The Answers will find the same preoccupations with grief and loss, what makes us love another person and why that love fades. Lacey writes about writers and their violations; our inability to communicate and the impossible texture of the English language; what happens when we are at the end of our sorrow and decide to give everything away; what happens when a person gets tired of being a person. Lacey is generous in her prose. She’s fun and feels deeply. These are stories to carry with you on long journeys, and to pick up again when you find it difficult to roll out of bed." "Catherine Lacey's prose is truly breath-taking. Her stories are sharp. Their insights into relationships, loneliness, and modernity will probably haunt you—for better or for worse." Section New Hardcover - Fiction / All Staff Suggestions / Fiction Suggestions / Kate B. / Spencer R.
One of Granta’s Best Young American novelists, Catherine Lacey, the Whiting Award-winning author of The Answers, showcases her literary style in short fiction with Certain American States, a collection of stories about ordinary people seeking―and failing to find―the extraordinary in their lives.